A few years ago, I was really into ambient solo instrumental looping. I was between bands and wanted to still scratch my creative itch and not focus on just practicing scales in the rock room all day. I began assembling some gear and got inspired by many ambient players out there. I was so impressed with the amount of emotion that could be felt from these players, and coming from a single musician. I was blown away. The major piece of this puzzle is acquiring and mastering the ability to loop parts seamlessly and know how to properly and effectively layer those loops. Additionally, you need to know how to play the melodies intertwined with the loops, weaving in and out to tell the story you’re trying to tell. At that time, there were a few loop pedals out there that many players were using. The Line 6 DL4 was a popular looper used by many of these artists. Also the Boss series (RC-3, RC-30, etc) loopers. I owned them both. The Line 6 was very limiting in my opinion, and was quite difficult. I then jumped to the RC-3. I liked the small footprint, but the ability to only stack a single bank was limiting to me. I eventually ended up with a Boomerang which was great and had many features, but I wish it had the ability to store loops. What seems to happen when working with various loopers, depending on what you want from them, you find them limiting in one way or the other. Sometimes that’s okay, sometimes it isn’t. I recently had the chance to play with the Electro-Harmonix 22500 Dual Stereo Looper, and I was pretty much blown away. The guys at Electro-Harmonix pretty much went the next level by offering an insanely feature-rich looper. It almost feels like they did some focus groups and talked with a lot of artists with different styles of looping to figure out what the other loopers on the market were lacking… and what they wished for. The unit is fairly simple to use. You definitely need to read the manual, but after a few passes, it’s very, very simple to use. Let’s get into some of the features. Memory was one of the things I wished the Boomerang had. Other loopers have memory, but a lot do not. The Electro-Harmonix 22500 Dual Stereo Looper comes with a SDHC slot and SDHC 8GB card that can hold up to 12 hours of loops. The unit is capable of holding cards up to 32GB. You can also connect the 22500 Dual Stereo Looper to a computer via USB and access the contents of that card for backups or uploading files. These files are stored in ‘banks’ and you get a total of 100 banks. 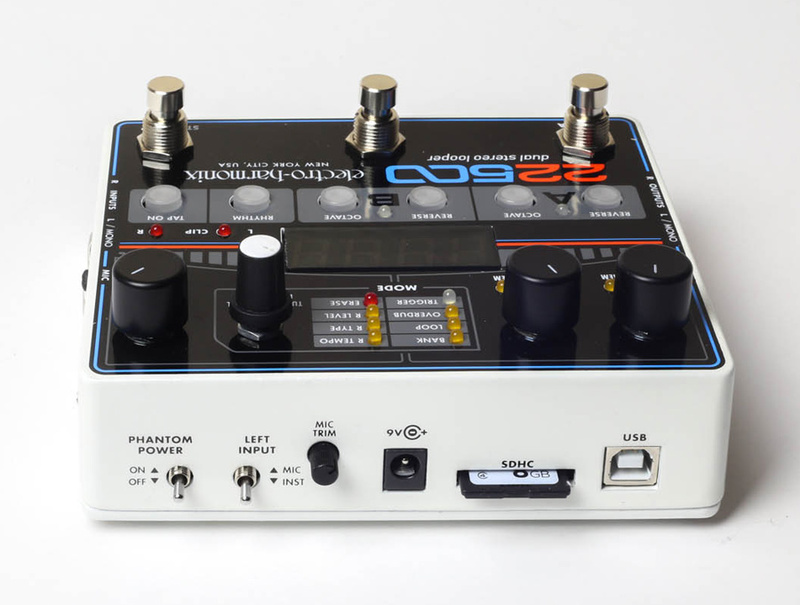 If you like to work with banks and pre-recorded loops, you’ll also want to purchase the 22500 Looper Foot Controller that connects to the looper and allows you to loop down/up through those banks. One thing that I used when I was playing around with the Boss pedals was the rhythm tracks. This was nice when practicing and working on scales, etc. Or just to play around with a simple blues progression for fun. The Electro-Harmonix 22500 Dual Stereo Looper has a rhythm button which you can start/stop with a footswitch. Additionally.. you can import your rhythms. Very cool. Many of the ambient players out there often play with stereo pedals, especially with those Strymon pedals. The 22500 has stereo in/out which can accommodate that nicely! One of my biggest requirements for a looper are banks. Most loopers let you stack, and that’s it. Meaning, add one loop on top of another over and over again. What happens if you record loop 1 then loop 2 then loop 3, but you want to remove loop 2? Stack loopers can’t do this. With banks you can stack on one bank and stack on another allowing you to turn off loop out of sequence. The 22500 has a Bank A and Bank B where you can loop in parallel mode. The 22500 also allows you to undo/redo on the fly with a long press on the bank button (same button you use to stop with double click or record with single click). Speaking of parallel, the 22500 let’s you set your mode between parallel recording (like I just mentioned) or sequence recording. Sequence is very cool where you record a verse part on Bank A, and when you go to record on Bank B (the chorus), Bank A stops. Then you can play between them to do a verse / chorus loop. Very nice to have to break the loop out of a linear build up. The 22500 has ‘modes’. These modes involve you to interact with the pedal directly (not via footswitch). Modes consist of the following – bank, loop, overdub, trigger, r tempo, r type, r level and erase. Bank mode allows you to select the banks within the SD card (100 banks). Loop mode allows you to set between parallel and sequential. Also you can get into some heavier stuff – quantize, freeform or loop-lock. Overdub mode is cool, very similar to the TC Electronic Ditto. It’s stack function, but as you add new loops, the earlier loops get quieter. You can set this threshold. Trigger automatically starts recording a new loop when the unit gets a signal. R Tempo adjusts the BPM and you can do this on the fly with previously recorded loops. I see lots of people ask about this. R Type is where you can set the different rhythm tracks. There are 16 rhythms to choose from. R Level is where you set the volumes of loops. Erase mode is how you clear loops or banks. You can select a or b, which would erase all loops in those banks, or you can get into the individual tracks within the banks. Each bank also has individual bank volume via knob control and there is an input gain knob to boost your input signal if needed. Now one thing that I didn’t think much about, since I play guitar is a microphone input. I know artists like Reggie Watts uses loopers (he use to use Line 6 DL4s and I believe he still uses the 45000 multi-track by Electro-Harmonix) and is a good example of the possibility of using loopers with microphones. Again, Electro-Harmonix thought of multiple applications for this and included an XLR input! Not only that, there is also the option of phantom power for the XLR for some of those high end microphones. The unit is the same size as a EHX POG2 enclosure. This thing is really small for everything that it does. Smaller than the larger loop stations and Boomerang. Finally, I wanted to talk about the price. 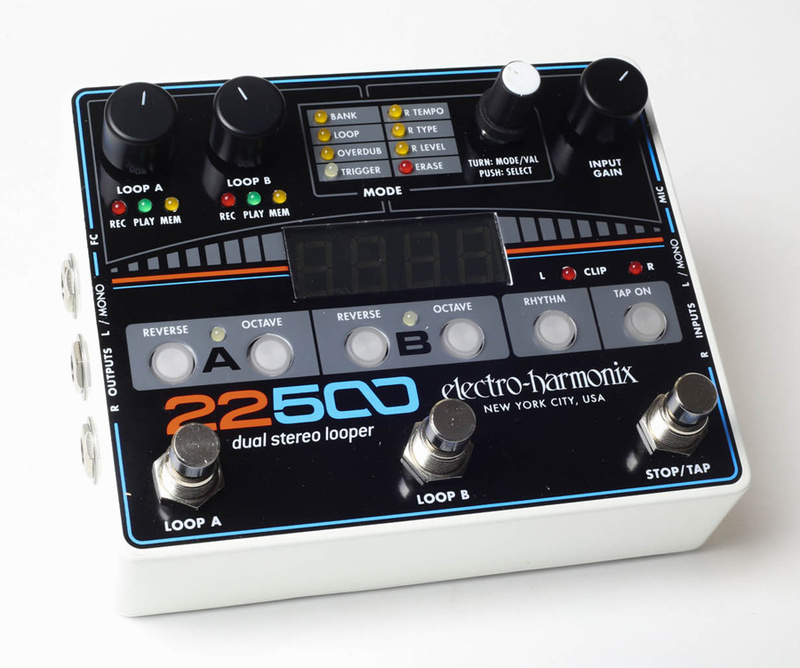 The Electro-Harmonix 22500 Dual Stereo Looper is available for only $276, which is crazy cheap compared to other loopers with similar, but far less features. The 22500 footswitch for quickly banking up and down loops is a great addition for only $88. If you’re in the market for a high end, high function and feature rich looper, the Electro-Harmonix 22500 Dual Stereo Looper might be exactly what you’re looking for. Definitely give a close look! 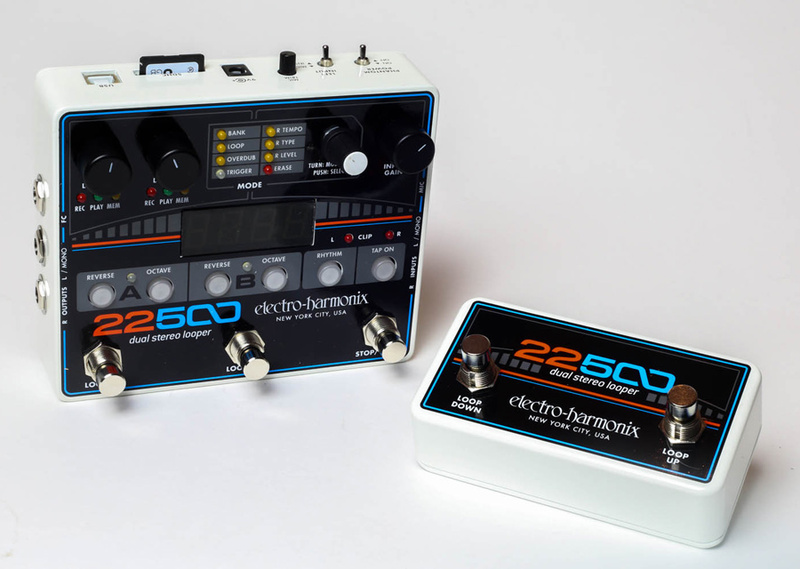 The post Electro-Harmonix 22500 Dual Stereo Looper appeared first on Effects Bay. PRS USA CE24 & Baritone SE Guitars – New for 2016!! NAMM 2016: Victory Launch BD1 Amp Head!